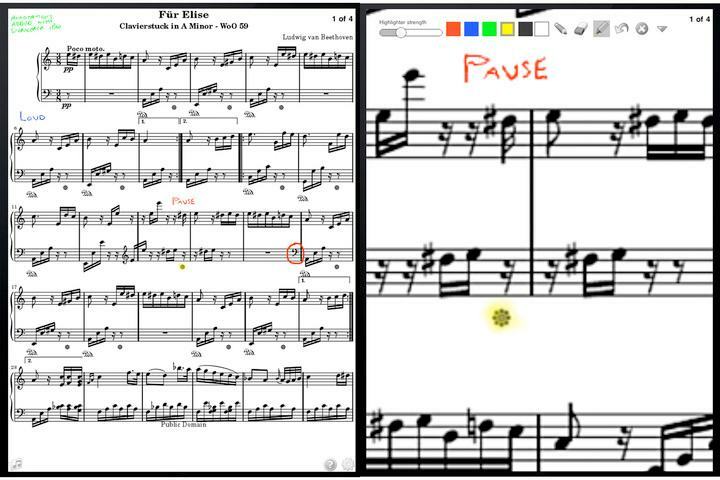 If Beethoven had an iPad, he’d want annotations. Lots of them. His iPad would be covered with fingerprints. Since today is Beethoven’s 241st birthday, it seems only appropriate to inject a little conventional notation into today’s coverage. And what better way to do that than with an iPad app that promises some musician-friendly reading features. We’ve already looked a couple of times at Avid’s Sibelius-powered Scorch iPad reader, which features nice output and score integration, and recently added PDF support. Scorecerer has some unique features – aside from, augh, a somewhat unpronounceable name. It goes further in page turn control, MIDI integration, and DAW integration (through MIDI program changes). A desktop version aids in scanned score management. And it has two potentially killer features: one is the ability to manage converting your conventional notation to PDF, and the other is – at last – proper markup. Markup: highlight or add handwritten notes (why every app doesn’t include this, standard, I have no idea – it’s a deal-breaker without it.) See the video for more. Meet your MIDI page turner: Load songs, change pages, from any MIDI instrument – or send page turns from a DAW’s sequence playback (via a program change message) for automated page turns. Total page layout control: Arrange pages in an arbitrary sequence, so, for instance, repeats and DS al Coda sections simply repeat in front of you instead of requiring you to go back. Desktop PDF conversion: Scan images or import PDFs, straighten out crooked scans, remove borders, create lead sheets, all in a batch-conversion desktop management tool. Desktop Pro software: Add on this US$39.95 desktop companion, and you additionally get to publish scanned or imported music as a set of images, PDF, Kindle DX, or MusicPad Pro. (The free iPad edition only exports to the iPad.) You can also batch convert a stack of music – like an entire fake book – by splitting it into PDFs. But I just keep coming back to this: you have to have markup. And I look forward to watching tablet apps in general work to provide features that make them more usable to musicians. There’s a free, “Lite” version that you can try out first. The full version is US$9.95.